The third most populous city in the U.S. is also home to some of the world’s finest architectural creations. 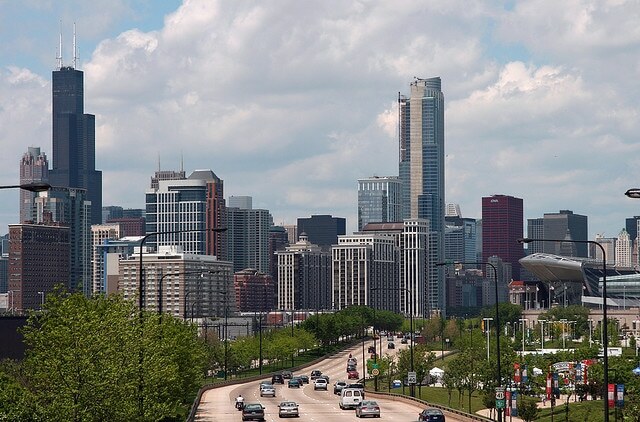 The Windy City boasts numerous skyscrapers and buildings with original styles and designs, which is one of the things Chicago is most well known for. It has long been an economic and cultural hub of the country, and many people consider it the capitol of the Midwest for these reasons. To offer some insight into the architecture that makes the city such a pleasure to visit, we think it only fitting to address the structures that stand apart and which have acted as a source of inspiration for other building developments. The Chicago School style of architecture originally emphasized the use of steel-frame buildings with large glass exteriors, which is why a majority of the late 19th century and early 20th structures contained these materials. Tube-frame construction was introduced mid-20th century by famous structural engineer Fazlur Khan, whose ideas had a direct influence on the development of structures like the Sears Tower and the John Hancock Center. The Willis Tower: The Willis Tower, better known by its popular alternative Sears Tower, was constructed in 1974. It is a steel structure that spans 1,451 feet in height, which at the time was a world record. The building contains 108 floors and is home to many businesses. The skyscraper took four years to fully complete and until 2004 it had the highest roof and highest occupied floor of any building on the planet. For those who are brave enough to venture to the top, there is a viewing ledge on the 103rd floor that visitors can step onto, which offers a breathtaking view of the urban expanse below. The John Hancock Center: Any project that costs nearly $100 million to complete is bound to boast some impressive statistics, and the John Hancock Center does not disappoint. This massive skyscraper reaches 1,128 feet into the sky and has 100 floors, in which both commercial offices and residential condos are housed. The building has an aluminum façade and steel structure; like the Willis Tower, it too took four years to finish. The building’s final phase of construction ended in 1969. To his honor, the John Hancock Center was the first trussed-tube skyscraper to ever be built, an idea by one of Fazlur Kahn’s former students, Mikio Sasaki. It is hard to imagine all the concrete construction tools that were used and the hours that were spent accomplishing a massive feat such as this, but the end result was definitely a success. This building has held the heart of Chicago for over four decades. The Chicago Board of Trade: Long before the previous two buildings were even conceptualized, the Chicago Board of Trade building held the title for being the tallest building in the city (there is clearly a trend of one-upping the competition in this city), a record it held from its creation in 1930 until 1965. The architectural theme of the Board of Trade building is art deco, as is evidenced by its light brown limestone façade. Although also made out of steel, the interior of the building comes off as more traditional. The building’s lobby features an array of floor designs, and there is even a giant statue of the Roman goddess Ceres on its roof. 333 Wacker Drive: When visiting Chicago, it is almost impossible to miss the skyscraper at 333 Wacker Drive. The curtain wall of glass is its most prominent feature. The entire building is covered in glass, which is not very common today and less so when it was built in 1983. To maximize the building’s aesthetic qualities, the lead architects Kohn Pedersen Fox made the curved wall to mimic the flow of the Chicago River. What it lacks in height in comparison to its predecessors (coming in at 487 feet) it makes up in décor. One of the grandest elements in this regard is the nine-panel mural, the largest painting made by famous painter Jim Dine. Another notable feature of 333 Wacker Drive is a massive bronze sculpture that can be found in the building developer’s office space.